Translate into . . . CHALLENGING LONG-HELD IDEAS ON SUSTAINABLE DEVELOPMENT, ENERGY AND THE ECONOMIC THEORY OF GROWTH. Will our grand-children be poorer than we are? Joseph Stiglitz: America by the side of the road. Posted on 2018-01-02 by Eric Britton Tagged 2018EconomicsEditorialFinancePolicyPolitics	CommentsNo Comments on REPUBLICAN TAX POLICY: A cruel scheme to cut social security while gorging the military-industrial complex. REPUBLICAN TAX POLICY: A cruel scheme to cut social security while gorging the military-industrial complex. The all-white, all male finance committees of both Houses of Congress got behind this bill. With straight faces, the salesmen for the Trump tax cut have promised a miracle: increased corporate profits, a surge of investment in CAPX, more and better jobs with higher pay, all to be paid for by accelerated economic growth. In fact, the all-white, all male finance committees of both Houses of Congress, with Treasury Secretary Mnuchin and Chief Economic Advisor Hassett say that the US will grow at 3% p.a. or more for the next ten years – no recessions – and that the tax cuts will actually generate a profit for the government of $300 billion in that time. Sadly (and no irony intended) this combination of goodies is a pipe dream. In the next few paragraphs I will explain why, and why Trump and the Republicans are selling snake oil to the suckers. What is surprising is how many financial professionals are buying it. In simple words, it is an impossible dream because higher profits come at a cost, either lower costs (i.e. less compensation for employees) or a bigger federal deficit, or both. The bigger deficit means increased debt service costs, at a time when interest rates are already rising and will rise faster. The supply-siders postulate a capital spending boom resulting in faster economic growth and “trickle down” into worker’s paychecks, since US unemployment is already at an historic low of 4.1%. In other words, they postulate increased economic growth first, to be followed by higher paychecks. Unfortunately, that is not how the economy works, which is why almost all economists say that this tax cut is a bad idea. Economic growth is driven mostly by consumer spending. But consumer spending is low today (apart from repairs and rebuilding after hurricane flood damage) because of years of cost-cutting by corporate managements. This cost-cutting, driven by activist investors, has led to record corporate profits even before the promised tax cut. Those record profits have not resulted in increased capital expenditure in most sectors. Why? Because there is no evidence of increased demand to justify it. Many consumer goods markets in the US are saturated. The debate about a “secular stagnation” due to slower technological innovation (except in Silicon Valley) was, and is, about that very topic (Gordon 2015, 2016). To conclude: tax cuts for corporations will not – cannot –stimulate more consumer demand unless, and until, after it generates higher incomes for the consumers, not the shareholders. The growth “bump” in Q3 and Q4 of 2017 was due to spending (of borrowed money) to repair and rebuild hurricane damaged housing and infrastructure in Texas and Puerto Rico (with fire damage in California yet to come). What this means is that tax cuts to corporations will not have much effect on economic growth. This means that more money for corporations and their shareholders must come from another part of the economy. The GOP legislative target, for many years, has been to cut “entitlements” and “big government” meaning social security, medicare, and other social programs, while devoting ever more of the federal budget to spending on military hardware to enforce US global hegemony. On corporate profits and workers compensation. The role of ideas; neo-liberalism.. The first point is that US corporate profits are now at an all-time high, in terms of percentage of the GDP. In fact, in 1917 corporate profits exceeded 9% of GDP, for the first time. Thanks to the assumed future cut in corporate tax rates (from a top rate of 35% to the new “competitive” rate of 20% or possibly 22%), government revenues will fall significantly in the next two years, while already record corporate profits will increase still further – according to the experts — from 9% of GDP to 10% or more. 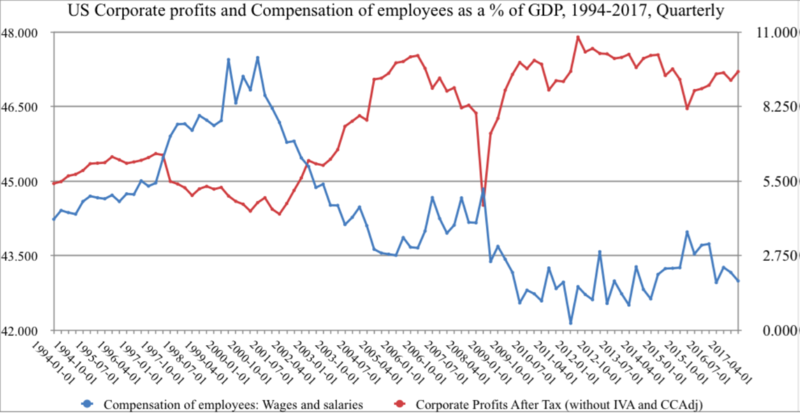 The second point is that there is a close (but inverse) historical correlation between corporate profits and employee compensation (Figure 1). When profits fall, as a fraction of GDP (as happened from 1997 until 2000), employee compensation (wages and salaries) rise; and vice versa. It works like a children’s see-saw or teeter-totter. When one end goes down the other goes up. From 2000 to 2006 compensation fell as profits rose. Then from mid-2006 through mid- 2008 it was declining profits and rising compensation. Since 2009 recovering profits have been accompanied by further declines in aggregate wages and salaries. Overall, since 1994, employee compensation (salaries and wages) have shrunk from 47% of the GDP to 43%. During that same period, corporate profits, after tax, have doubled, from 4.5% of GDP to an astonishing 9% of GDP. It sure looks as though the increased profits are coming straight from the pockets of the employees and workers. Of course, if history keeps repeating itself, we can expect compensation as a fraction of GDP to start increasing, after 2017 as the traditional Phillips curve relating unemployment to inflation, would predict. Higher compensation, in turn, would increase demand for goods and services, and thus drive economic growth. The only problem is that, so far, there is (almost) no sign of increasing compensation. It seems that corporations with increasing free cash-flow are not choosing to spend it on making their workers happy. Their activist shareholders want higher dividends or increased share buybacks instead. Higher share prices also result in higher executive pay, resulting in increased income inequality. Economists are wondering whether the Phillips curve is dead. Why has employee compensation been stagnant or (for the lowest income group) been declining for 30 years? More specifically, why has it declined from 2000 until 2005, then risen briefly until 2008, but then kept declining further since 2009? The simple answer is that higher profits are normally achieved by cost-cutting, and employee compensation is a cost. To be sure, that has always been the case. But it is also true that business ethics and practices have changed radically since the 1970s. The shift has been marked by a series of influential anti-Keynesian books, and partly by the spread of “free market” liberalism as an antidote to Soviet Communism. That was kicked off by Friedrich Hayek’s best-seller “The Road to Serfdom” (Hayek 1944) and later amplified by “Capitalism and Freedom” by Milton Friedman (Friedman 1962) and the rest of the ‘Chicago School’ with its 12 Nobel Laureates. Friedman’s neo liberalism was accompanied by the more extreme libertarian ideas of Ayn Rand’s blockbuster novel “Atlas Shrugged” (1957) – still the Bible of Libertarian true believers — followed by her philosophical treatises: “The Virtue of Selfishness” (1964) and “Capitalism the Unknown Ideal” (1967). Among other “thought leaders”, Arthur Laffer’s famous curve, showing that tax revenue is not maximized by applying the highest possible tax rates, was drawn on a napkin at a dinner hosted by WSJ writer Jude Wanniski in 1974. That event, and Ronald Reagan’s l made “supply-side economics” a household term. In 1981 supply-side economics was glorified by “Wealth and Poverty”, a best-selling book by George Gilder (Gilder 1981). So much for the spread of ideas, in the ivory towers and the business schools. The years 1969-71 were critical for different reasons. First, they marked the peak of US domestic oil production, which rather suddenly made the US an importer, and gave the newly created Organization of Petroleum Exporting Countries (OPEC) real economic power and leverage. That power was demonstrated soon after when the Arab-Israeli conflict broke out in 1972 and the OPEC countries responded by embargoing oil shipments to the US, UK and Netherlands. That change, alone, has had important downstream consequences for the economy. Because of US inflation, due to the Viet Nam war, foreign governments were worried about the declining value of their dollar reserves. In 1970 Switzerland, Germany and France all started exchanging their dollars for US gold. This prompted President Richard Nixon to respond. On August 15, 1971 Nixon unilaterally closed the “gold window” in the Bretton Woods accords, that allowed foreign governments to exchange their dollar reserves for US gold at the fixed price of $35/oz. This move effectively ended the Bretton-Woods era of international financial regulation. By 1980 the price of gold, on the open market, had reached $600/oz. This shifted a lot of wealth from countries without gold reserves to countries with gold. It also made the US dollar – no longer backed by gold — the international reserve currency and enabled the US to do what no other country can do, which is to buy foreign goods on credit. (Only the US can have a large trade deficit – financed by selling government promissory notes (bonds) — at the same time as it has a large domestic budget deficit, also financed by debt. In fact, the US money supply (followed by the rest of the world, started to grow after 1972, as individual banks – unrestrained by gold, or by the Treasury Department or the Federal Reserve Bank, made loans to any business offering collateral (or any sovereign country) willing to borrow – usually in order to pay for oil. Every bank loan creates a bank deposit, on which the bank pays interest, which adds to the money supply. Of course the growth of the US money supply (Figure 2) was matched by the growth of private debt. In 1970 the traditional broker-dealer partnerships and investment banks began to incorporate themselves. The first to do it was the (then) new brokerage Donaldson, Lufkin and Jenrette (DLJ). This move was followed by all of the other Wall Street partnerships. Salomon Brothers incorporated in 1981. The last to incorporate was Goldman-Sachs, in 1998. The net effect of incorporation vs partnerships was to sharply decrease the personal risks of financiers, while simultaneously enriching them enormously. The former partners had risked their own capital. After an IPO, the people in charge could make bets with other people’s money at much less risk to themselves. They have done so, in spades, ever since. Two other deregulation steps, from the 1970s, were made by the Securities and Exchange Commission (SEC), during Gerald Ford’s administration. One change in 1975 was the designation of three privately owned credit rating organizations (Moody’s, Standard & Poor’s and Fitch) as “official” arbiters of credit quality (i.e. Nationally Recognized Statistical Rating Organizations or NRSROs). The fact that the NRSROs are paid for ratings by credit issuers was an obvious conflict of interest. But it was ignored until it turned out to be one of the major factors in the so-called “sub-prime” crisis of 2008. Another SEC innovation (also in 1975) was to eliminate fixed fees by brokers, introducing competition into a previously status quo oriented financial world. Another step in deregulation was the privatization of the federal housing support system, known as Fannie Mae and it’s junior spin-off Freddie Mac, in 1970-72. At that point Fannie Mae and Freddie Mac were allowed to buy mortgages (from S&Ls and other mortgage creators) that were not insured by the Federal Housing Authority (FHA). Soon the mortgages were being bundled and the bundles were bought and sold in packages. Soon after that, mortgage-based bonds were “invented” in 1978 or so by Lewie Ranieri and his bond traders at Salomon Brothers (Lewis 1989). Soon mortgage-based bonds were treated as AAA-rated assets, for use as bank capital reserves, and as collateral for loans of all kinds. This financial “invention” drastically increased collateralized lending, hence the money supply. The mortgage-based bond trade made Salomon Brothers the most profitable firm on Wall Street, by far, during the early 1980s. At first, loans were used primarily for financial purposes (e.g. mergers and acquisitions) but gradually the money moving around in the Wall Street stratosphere trickled down through the banks, enabling them to finance consumer credit cards and educational loans. In short, the money supply grew rapidly thanks to the creation of mortgage-based bonds and their use as collateral. Yet, for some reason the increased money supply since 1980 has not resulted in a corresponding increase in the output of real goods and services, or in the wages of most workers (except those in the finance sector itself). The explosion in “finance” as a component of overall economic activity started in the 1980s. The invention of mortgage-based bonds also triggered the next great financial innovation “junk bonds”. Starting in 1983 or so a new breed of “activist” investors, arrived on the scene. Financed by “junk bonds” sold by Drexel Burnham Lambert’s star employee, Michael Milken, their names remain well-known in corporate board-rooms: Edelman, Einhorn, Goldsmith, Icahn, Jacobs, Peltz, Perelman, Pickens, Steinberg and others. Many current hedge and private equity funds were started during this period, including the Blackstone Group and Kohlberg, Kravis & Roberts (KKR). In 1982, President Reagan’s appointed a new Chairman of the Securities and Exchange Commission (SEC). His appointee, John S.R. Shad (previously at E.F. Hutton, a broker) decided to re-interpret the Glass-Steagall law of 1933. The creation of Rule 10b-18 created a “safe harbor” for firms to repurchase their own shares, as long as they didn’t do it too fast. This had previously been forbidden by the banking law of 1933 as “manipulation.” What buybacks do, in practice, is to give money to shareholders willing to sell (who will usually re-invest it elsewhere in the market), reduce the number of shares outstanding and thus increase profitability, and price, per share. Since 1982 – thanks in part to Jensen and Meckling’s theory of the firm (Jensen and Meckling 1976) – top corporate manager’s compensation has been increasingly linked to share price, a supposed measure of managerial performance. This has resulted in a boom in corporate share ‘buybacks’, especially since the full repeal of the Glass-Steagall law in 1998 and a growing discrepancy between executive pay and the pay of lower ranked employees. So-called “activist” investors (informally called “raiders”) have managed to impose their shareholder value-maximization ideology in most of the corporate board rooms of publically traded companies. Consequences vary from firm to firm but, overall, the result has been to spend an increasing share of corporate profits on share buybacks and dividends, while cutting back on re-investment in the firm’s business, and on R&D. One of the other interesting, but little studied, consequences of the changes since 1982 has been the increasing use of periods of ultra-low interest rates, thanks to accommodative monetary policy, to purchase shares, for mergers and acquisitions. In 1985, when the “Reagan boom” started, borrowing on margin, sometimes for the purpose of buying shares, was negligible, around $20 billion. By the “dot com peak it had risen to around $320 billion. After a short pullback in 2002, it rose again to over $750 billion in the summer of 2008 before falling to $400 billion in the winter of 2009. In 2017 the level of borrowing on margin to buy shares is at an all-time high, above $800 billion. The rise in market cap has been accompanied by a further rise in borrowing for the purpose of buying shares (Figure 2). We now live in the age of powerful activist investors, hedge funds and private equity partnerships. None of these existed in 1980, and very few until the rise and fall of Long Term Capital Management. It is a fact that “raiders” and “activist” investors inspired by Milton Friedman and the Harvard Business School focus with laser-like intensity on ways for their target firms to increase their profits by cutting costs. Cost cutting is usually explained in terms of focusing on “core competence”, selling land or buildings, eliminating unprofitable branches or unprofitable products, and (yes) even laying off older workers who are approaching pension age. Other devices in the cost-cutting bag of tricks include cutting employee health benefits, reducing R&D, reducing employee training, converting pensions from “defined benefit“ to “defined contribution” and more. The “bottom line” is that in virtually all cases of mergers, acquisitions and “corporate restructuring”, the employee “head-count” is reduced. This is lauded by academics such as Jensen and Meckling (ibid), as increasing efficiency. But cost-cutting means cutting wages and salaries (and jobs), which are the major costs in most sectors of the economy. 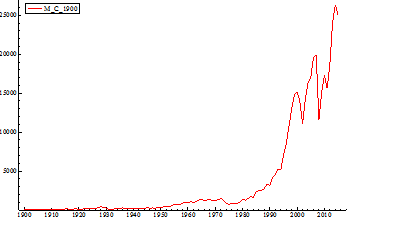 In short, the inverse relationship between corporate profits and employee compensation since 2000 (Figure 1) is a direct consequence of business doctrines and practices introduced in the 1970s and 1980s, just as those same doctrines and practices have led to a radical increase in the use of public stock offerings, mergers and acquisitions (M&A) to increase scale and reduce competition. 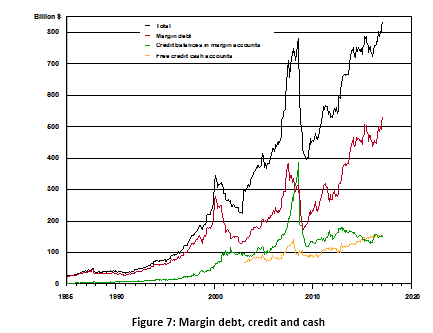 In effect, low interest rates on conventional government bonds thanks to accommodative monetary policy, together with the invention of mortgage-based securities, have enabled a series of major stock-market offerings (IPOs) – mostly in the field of information technology — since 1990 or so (Figure 3). These have offered higher financial returns and attracted massive amounts of financial wealth away from traditional investments in bonds. The rise in market value of shares is matched by the declining returns on bonds. The Gross national product (GDP) is defined as the sum total of all payments in the economy. It is very helpful to think of the GDP as a “pie”. The pie is traditionally divided (by economists) into two parts. The first, and largest, is called “returns to labor”. This includes all wages and salaries paid directly to workers, plus the sum total of “entitlements” (from government), such as pensions, social security, health benefits, educational benefits (such as the GI Bill and “Head-Start”) and unemployment benefits. The other (smaller) part is called “returns to capital”. It includes interest payments on loans (debt service), dividends, rents and royalties. During long periods in the 20th century, returns to labor accounted for 75 to 80 percent of GDP, while returns to capital fluctuated around 20-25 percent of GDP In fact, that relationship between returns on labor and returns on capital has long been regarded by economists as a “stylized fact”, somewhat like a constant of nature, but not quite. However, since the 1990s that comfortable historical relationship has changed, partly due to regulatory and other changes in the financial system, especially by monetary policy. Only the central bank – the Federal Reserve Bank (FRB) – has the power to change the returns on (costs of) capital. The FRB does this by raising or lowering the “Fed Funds rate”, which determines the so-called “prime” rate on which all loans are based (Figure 4). The history of US prime interest rates is quite interesting, but for now only the most recent 50 years are relevant. Note that the all-time peak occurred in the months between December 1980 and early spring 1982, when the FRB under Carter appointee Chairman Paul Volker, decided to kill “inflationary expectations” once and for all. It seems to have worked, because interest rates have declined (discontinuously) since then apart from some short –term fluctuations. But the key point is that returns on capital are mostly the cost of debt-service. Debt rarely decreases. Quantitative easing (QE), after 2010, converted some private debt into government debt. But only war, revolution, bankruptcy, or natural disaster can actually wipe out debt. Neither monetary policy nor fiscal policy can cut debt, although bankruptcy courts (allowed by law) can do so. True, monetary policy can change the carrying cost of federal debt, but the FRB has signaled that debt service will increase in the coming two years (2018-19) at least. Fiscal policy normally increases debt, as the giant Trump tax cut for corporations will undoubtedly do. While interest rates have declined overall (apart from those fluctuations) since 1982, aggregate debt has grown even faster, and the cost of servicing that aggregate debt has grown with it. Fluctuations matter. It is worth noticing that in 2005-6 the FRB under Alan Greenspan raised the Fed Funds rate, which raised the prime rate from 4% p.a. to 8% p.a. in several steps. This increase sharply raised the cost of borrowing, just before the financial collapse in 2008 forced another sharp reduction in rates. Since 2010 the prime rate has been kept near 3.5% until the first increases in 2016. But the point of this chart is that the cost of capital – and mortgages — took two sudden leaps, first in 1994 to 2001 followed by a sharp decline from 8% or so to around 4.5 % and again in 2006 -07 when rates jumped again to nearly 8% in 2007 just before the crash of 2008. Some would see a causal connection between the two events. I leave that question to future economic historians. But what can be said for sure is that when the prime rate more than doubled in 2006 and 2007, the overall returns on capital increased very sharply – as a fraction of GDP — during those years. That theoretically left less pie (wages and salaries) for the workers. Yet workers compensation did also increase slightly during those three years, thanks mainly to the sub-prime real estate construction bubble. That led to a major imbalance in the financial system: rising interest rates couldn’t co-exist for long with rising wages. Something had to give. The money had to come from somewhere, probably from some homeowners “cashing in” from rising home values, which looked like economic growth but wasn’t. The housing bubble couldn’t last, so it didn’t. The banks were over-extended (largely due to mortgage-based securities) and two of them failed. Bear-Stearns was bailed out, but Lehman Brothers was not (for fear of establishing a precedent) (Ayres 2014 ). Wages fell and unemployment rose dramatically in 2008-09. The current prime rate is 4.25%, having increased from the low of 3.5% between 2011 and 2016. N.B. the prime rate is already 0.75% above its recent low, and is targeted for further increases in 2018 to at least 5% and possibly 5.5%. After that, who knows? It is true that civilian unemployment has been declining in recent years (see Figure 5). It is now (late 2017) 4.1%. That is regarded by most economists as good news. What the unemployment statistics do not show, however, is that when unionized middle-aged construction workers, or auto workers, are laid off, the alternative jobs they can get, like security guards or truck loader/unloaders (sometimes called “McJobs”), pay a lot less than their old jobs and often cannot support a family. So unemployment can decline, and profits can rise (as they have) without any significant increase in wages and salaries. N.B. the postwar peak unemployment – nearly 11 % — occurred during the recession of 1981-2 instigated by the 20.5 % prime rate peak in 1981. The three following recessions (1990, 2001, and 2008-9) all caused sharp increases in unemployment, followed by relatively gradual recoveries. Unemployment jumped from about 4.5% in early 2008 to nearly 10% in early 2010 before starting to decline gradually. The GOP tax bill postulates that there will be no more recessions, for the next ten years. Yet recessions occur with some regularity as Figure 5 also shows. The longest periods between recessions were the 1960s (9 years), the 1980s (7 years) the 1990’s (8 years) and the period since 2009 (8 years). Many economists think that the next recession is due any time, even though the exact trigger is unclear. However, what worries many economists is the possibility of a sharp rise in interest rates, driven by inflation worries. A sharp rise in consumer spending (assumed by the Tax bill) – given the full-employment environment — could trigger the next recession. Rising federal deficits will increase federal debt. If this happens too fast, a sharp rise in interest rates could follow. But the most likely trigger would be rising private financial debt. 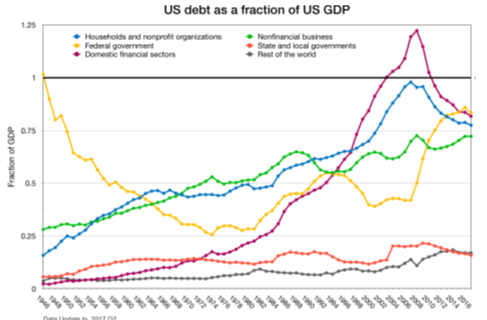 Total US debt is now very high, though perhaps not as high as possible. (Japanese debt, for one example, is higher as a fraction of GDP.) US private debt was very low after WW II. Business and household debt grew (as government debt fell, even during the Korean and Viet Nam conflicts) until the 1970s, is shown in Figure 6 below. It has increased enormously from the early 1970s to the current level, mainly in two periods. The first (1986-1990) was during the second term of the Reagan administration, when tax cuts and increased military spending (plus increased oil imports) caused federal debt (as a percentage of GDP) to double, while financial debt – much of it driven by mortgage-based bonds and Michael Milken’s “junk bonds” – increased even faster. During those years household debt and non-financial business debt increased too, but only modestly. In fact, federal debt actually declined from 1994 to 2002 (the Clinton years) when interest rates were high. But financial debt, household debt (mainly home mortgages) and non-financial business debt both increased rapidly from 2003 to a peak in 2008. But they fell sharply during the financial collapse in late 2008. That was when the federal government had to step in with the Troubled Asset Relief Program (TARP). TARP bailed out the banking system (at taxpayer expense) but did not help the millions of home-owners who found themselves “under water” after house prices fell but mortgage payments didn’t. Many of those middle-class homeowners may have voted their anger iy because much of the bank’s share of it was converted to government (taxpayer) debt by TARP and the bailouts. But the question now arising is quite simple: Is there any way to increase corporate profits, debt service (interest) payments and employee compensation simultaneously (as fractions of the GDP) without another major recession, or even another financial collapse? This circle can only be “squared” in one of two ways: (1) by borrowing more money (increasing the debt, but keeping interest rates very low) or (2) by cutting off the indirect returns to labor (“entitlements”) such as social security, health care, food stamps, and other social programs. That has been the GOP objective for decades, but now they have come up with a scheme to make it happen without taking credit for doing it. These future cuts in social programs are not explicitly promised by the current Republican tax cut legislation. But, even without promised wage increases, cuts to “entitlements” such as social security and health care will follow inevitably – as the night follows the day – under this administration. They will say “there is no money” (because they gave it all away to the corporations and their shareholders, and the military-industrial complex). Of course, there is one other way to re-balance the budget. Dare I say it? In principle, the US could reverse Trump’s 50% increase in military spending and start cutting back on its bloated military machine and putting the unneeded and unproductive soldiers back to work in the civilian economy, where there is now a need for workers. I doubt that this will happen. What will happen next? The answer is almost certainly (1) no increase in worker compensation despite promises and very little increase in corporate profits because the economy will slow down, not accelerate (because of no increase in worker incomes) and (3) another giant stock market bubble. A “tax holiday” to bring back profits being held overseas was tried by the second Bush administration in 2005 as part of The American Jobs Creation Act (PL 108-357)(Levin et al. 2011). The tax rate for funds repatriated under the Act ($299 billion was repatriated) was set at 5.25%. The corporate promoters and their lobbyists back then said that 500,000 new jobs would be created in 2 years. What actually happened was different: The top 15 repatriating companies reduced their total US-based employment by 20,931 jobs (about 35%) between 2004 and 2007. (A few companies reported increased employment, but only because of mergers or acquisitions). Did they spend the money on R&D? Academic studies found no evidence of any increase in R&D expenditure (Blouin and Krull 2009, Dharmapala, Foley, and Forbes 2011). Where did the money go in 2005? It went into the stock market and executive compensation. Use of repatriated funds for share buybacks was explicitly prohibited by the Jobs Creation Act of 2004. But, strangely, share repurchases by 19 major repatriating firms surveyed (including the top 15) increased from $2.2 billion per firm (average) in 2003 to $2.5 billion (average) in 2005 and jumped to $5.3 billion (average) in 2007. Share buybacks and executive compensation were the only expenditure categories that increased as a result of the repatriation of $299 billion in 2005. A much larger pot of money – probably in excess of $1 trillion (President Trump sets it much higher) – from repatriated overseas profits and increased free cash flow in domestic companies, will be spent on share buybacks in 2018 and 2019. The total number of shares in circulation will decline sharply, resulting in (briefly) higher prices per share. Moreover, the long decline in T-bill returns is now probably at an end. The corresponding boom in bond prices, that has kept pension funds looking safe (without actually being safe) is also over. Where will investors find the higher returns they desperately seek? Some are being attracted by bitcoins and other crypto-currencies. Most will put their money into corporate equities or real estate. Why not real estate? The middle class housing market is unlikely to repeat the “boom” of 2003-07. There are too many bad memories of the outcome. Too much home equity was lost. Suburban shopping malls are now in trouble, thanks to Amazon. Will hotels for Chinese tourists and high-rise apartments for singles make up the difference? I doubt it. That leaves only the S&P (and Nasdaq) for most investors to bet on. 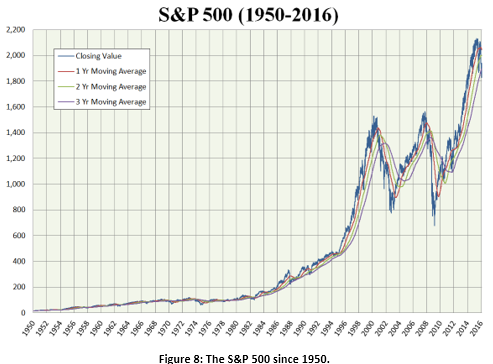 I think the stock market is about to experience another peak much higher than any in the past, followed by another collapse. How high will it go? Your bet is as good as mine. But what goes up will come down painfully, if history is a guide. Much of that money will be lost when the recession comes and the stock market falls again. The socio-political consequences of yet another major unpredicted calamity, following an enormous “hype” by a President Trump and a political party representing the interests of the most wealthy, may be extremely dangerous, especially in a country where a lot of people have guns. Is there a risk of a financial collapse, such as in 1929, 1987 or 2008? One of the danger signals that can provide warning – at least as a measure of increasing risk, is investment in bubbles, such as crypto-currencies. When a bubble approaches the “euphoric” stage many retail investors, and some professionals, convince themselves that “this is not a bubble, but a new long-term trend and now is the time to get in before it is too late.” A lot of “bitcoin” investors are investing now at high prices because they believe the rumors of an underlying technology (“block-chain”) that will soon enable financial transactions to be untraceable by governments, thus being very attractive to everybody, not just criminals and money-launderers. They believe that this new technology somehow provides crypto-currencies with an underlying value. (I doubt this, but I can be wrong.) It is virtually certain that governments will not permit bitcoins to be a substitute method of payments in place of treasury/bank money. The problem speculators will have later, on the “back” of the bubble, is that people with bit-coins to sell may have trouble finding buyers. My point is that in all historical bubbles, when euphoria takes over, people start borrowing money to buy more of whatever is “hot”, using their shares as collateral. Margin debt (Figure 7) is a measure of how much money is being borrowed – partly (one assumes) — for that purpose. Just before each of the last two stock market peaks (2000 and 2008) the margin debt rose very sharply. But when the share price peaked and started down, the collateral declined in value and banks start to call in those margin loans. That process, in turn, accelerates the decline and can turn it into a crash (which is exactly what happened in 1929). Are we near that point today? Most of the money managers interviewed by CNBC are optimistic: they all think there is more upside to come. But that was true before the other crashes. My analysis above also suggests this possibility (of more upside to come), but I don’t bet on my ability to ride the roller coaster up and sell at the top. Of course I can’t say for sure that the peaks in margin debt are measures of investment in shares, using the shares themselves as collateral. I just think it is quite plausible. The correlation between margin debt and stock market value (Figure 8) is obvious and ominous. 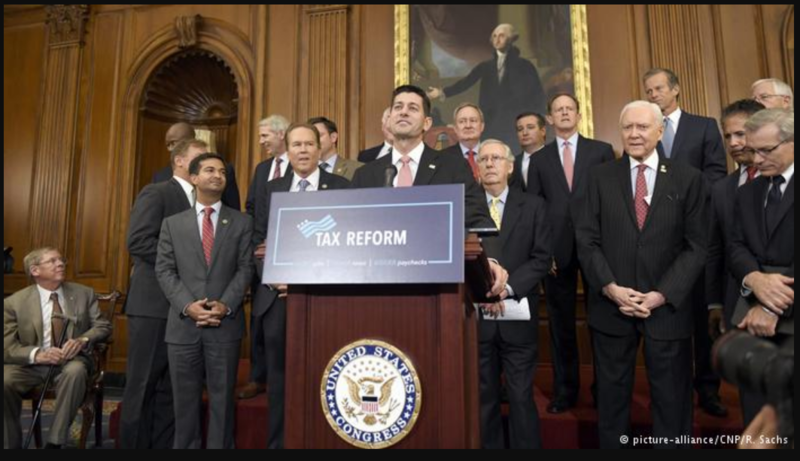 To conclude, in a sentence, this misbegotten tax “reform” should be stopped before it is too late. Ayres, Robert U. 2014 The bubble economy: Is sustainable growth possible? Boston MA: MIT Press. Blouin, Jennifer, and Linda Krull. 2009. “Bringing it home: A study of the Incentives Surrounding the Repatriation of Foreign Earnings Under the Jobs Creation Act of 2004.” Journal of Accounting Research 47:1027, Tables 2,3. Dharmapala, Dhammika, C. Fritz Foley, and Kristin J. Forbes. 2011. “Watch what I do, Not what I say: The Unintended Consequences of the Homeland Investment Act.” Journal of Finance 66:753-756. Friedman, Milton. 1962. Capitalism and freedom. Chicago: University of Chicago Press. Friedman, Milton. 1970. “The social responsibility of business is to increase its profits.” New York Times Magazine, 13 September, 32. Gilder, George. 1981. Wealth and Poverty. NewYork: Basic Books. Gordon, Robert J. 2015. “Secular Stagnation: A Supply-Side View.” The American Economic Review 105 (5):54-59. Gordon, Robert J. 2016. The rise and fall of American growth. Edited by Joel Mokyr, The Princeton Economic History of the Western World. Princeton: Princeton University Press, Oxford University Press. Hayek, Friedrich August. 1944. The road to serfdom. Chicago: University of Chicago Press. Jensen, Michael C., and William H. Meckling. 1976. “Theory of the firm: Managerial behavior, agency costs and ownership structures.” Journal of Financial Economics 3 (4):305. Jensen, Michael C., and William H. Meckling. 1994. “The nature of man.” Journal of Applied Corporate Finance 7 (2):4-19. Levin, Carl (Chairman), Elise J. Staff Director and Chief Counsel Bean, Robert L. Counsel and Chief Investigator Roach, and Tom Coburn, Ranking minority member. 2011. Repatriating Offshore Funds: 2004 Tax Windfall for select multinationals, majority staff report. Washington D.c. : United States Senate. Lewis, Michael. 1989. Liar’s poker. London: Hodder and Stoughton Ltd. The “safe harbor” protects buybacks that do not exceed 25% of the volume of trades in the previous 4 weeks. The most admired practitioner was Jack Welch, CEO of General Electric Co. from 1981 to 2001 who led the growth of his firm from $14 billion to $280 billion in market value, making 600 acquisitions along the way, earning $750 million in bonuses and options for himself. During the 1980’s “raiders” used high-yield debt (“junk bonds”) – mostly from Michael Milken– to acquire businesses against the wishes of the then current Board of management, “hostile takeovers.” They’d leverage the assets of the businesses against the debt, often replacing management, laying off staff, selling assets (including pension funds), and diverting profits to service the debt used to take over the business. Eventually, they used the threat of takeovers to demand payouts (“greenmail”). Laws were eventually changed so that hostile takeovers were more difficult but, by that time, the raiders were well funded and regrouped as “activist investors,” demanding that management do their bidding. Those securities have financed a series of later investment booms, mostly based on information flow (“the information highway”) starting with telecoms, cable-TV, cell-phones (Nokia, Motorola), internet browsers and search engines (Google, Yahoo), “smart phones” (Apple, Samsung) and “social media” (Twitter, Facebook). This entry was posted in 2018, Economics, Finance, Policy and tagged 2018, Economics, Editorial, Finance, Policy, Politics. Bookmark the permalink. ← WHY THE REPUBLICAN TAX BILL SHOULD FAIL IMMEDIATELY. MISSION Challenging long-held ideas on sustainable development, energy and the economic theory of growth.